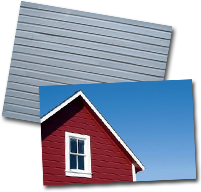 Toronto Aluminum is the market’s most reliable vinyl and aluminum siding company in the Greater Toronto Area. We do installations and supply material for any type of siding projects. Our company’s promise is to deliver only exceptional value to all our customers from the materials we use to the actual installation process. Our state of the art vinyl products as well as all of our accessories are coated with the most advanced WeatherStopper 4000™ formula, which ensures optimized protection and lower maintenance to your home siding package. We do all aluminum work from eavestroughs, soffit, custom made fascia, flashing, capping, and also windows and doors. The newest product is 6” half-round eavestroughs in aluminum and copper. What makes a good siding installer? Looking at many of the current homes within the GTA, it becomes fairly apparent that homeowners, contractors, and builders alike are all looking towards siding as the go-to option for all new and existing home renovation. If correctly installed, siding can exponentially increase the curb appeal of a house, and with it’s cost-effectiveness, aesthetic, and durability, it’s becoming the sure choice for any home renovation. With the endless options of siding choices from vinyl, aluminum, wood, and even cement board, siding contractors and professional installers are required to have a wealth of knowledge to keep current with the ongoing demand for siding used in home renovations. We have been in business for over twenty years. Our labour is guaranteed for seven years, and material for 25 years.